We spent two days this summer at Yasuragi Kids. 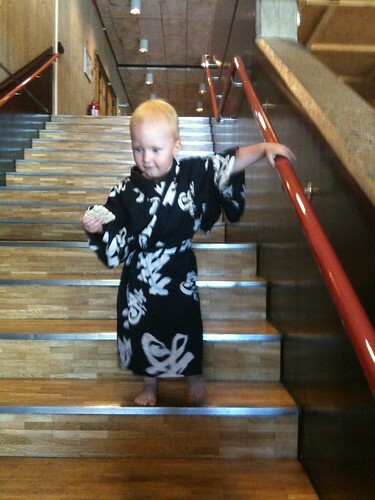 It's a Japanese Spa in Stockholm that has a special summer deal where you can actually bring your kids. (Let me state right away that it's not a great idea if you don't have kids, and want to actually relax - it's pretty noisy!) We had a great time, and so did Titus. We mostly played in the pool, and enjoyed the outdoor hot pool as well. And everyone walks around in their robes, yukatas, that you get at the spa. Even little ones! The food was great - there was a superb kids' buffet with Yakitori Chicken Skewers, Chicken Dumplings, rice, all sorts of vegetables, poached salmon and much more. I opted for a not so healthy option, but oh so good - tonkatsu, which is deep-fried pork. It was served with a very salty, thick dipping sauce. 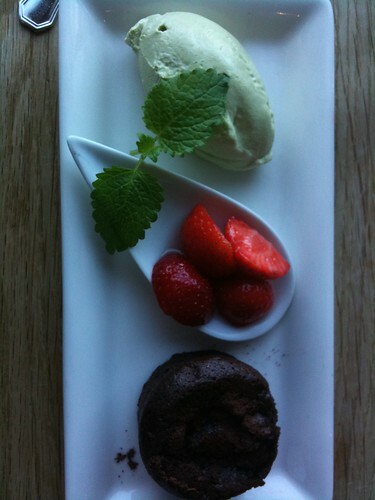 For dessert, a slightly over-baked chocolate fondant, with marinated strawberries and a matcha whipped cream. It was pretty disappointing, mostly because I realized I really, REALLY don't like matcha. We plan to go back to eat at their Teppanyaki restaurant later this fall, as they're closed over the summer.